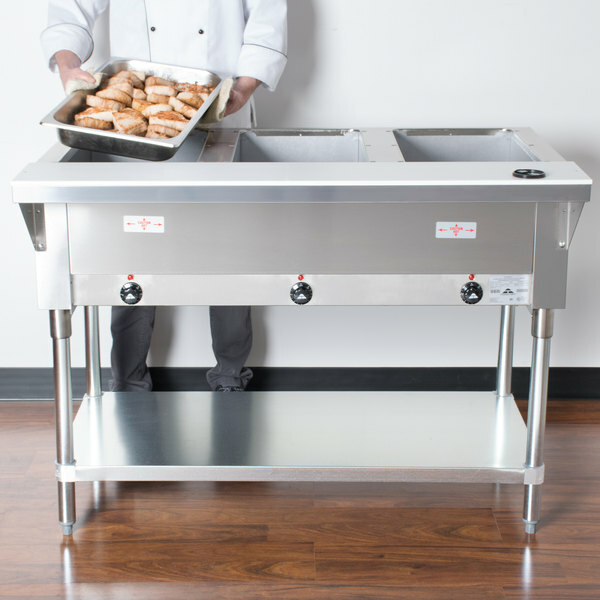 Keep all of your menu items piping hot and readily available with the Advance Tabco HF-3E-120 three well electric open well steam table! 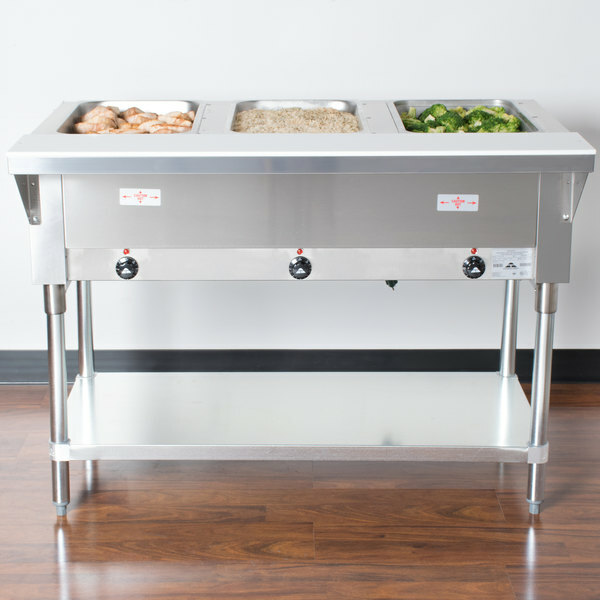 Featuring 3 spacious holding wells, the Advance Tabco HF-3E-120 electric open well steam table is the perfect solution for holding your food and keeping it warm and delicious! 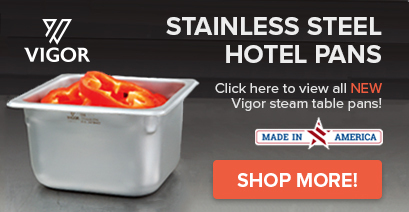 Each 12" x 20" food pan is perfect for filling with pasta, meat, or other delicious foods and keeping them warm and ready to serve. 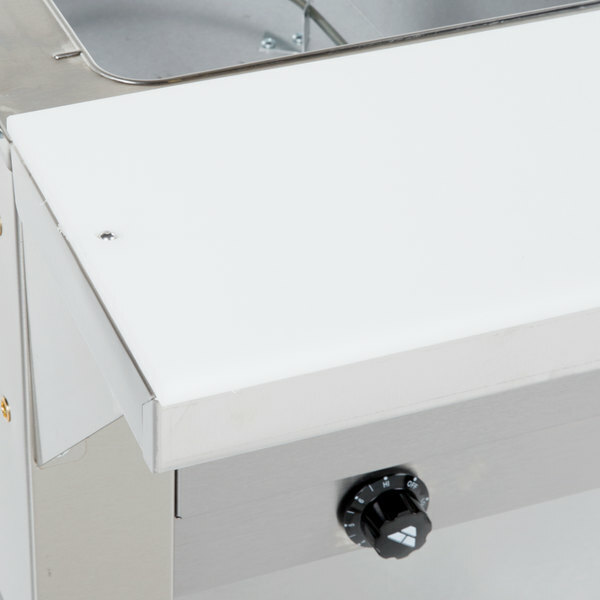 The white thermoplastic full length cutting board gives you a little extra work space for changing out food pans or filling plates, Plus, for convenient cleaning, this cutting board is also removable and it is supported by a full length shelf, ensuring excellent stability and peace of mind. For optimum heating versatility and temperature retention, each individual well is warmed by an exposed, easy-to-clean heating element independently controlled by an infinite control knob. Additionally, fiberglass insulation between the wells allows for better heat retention and different holding temperatures for each well. 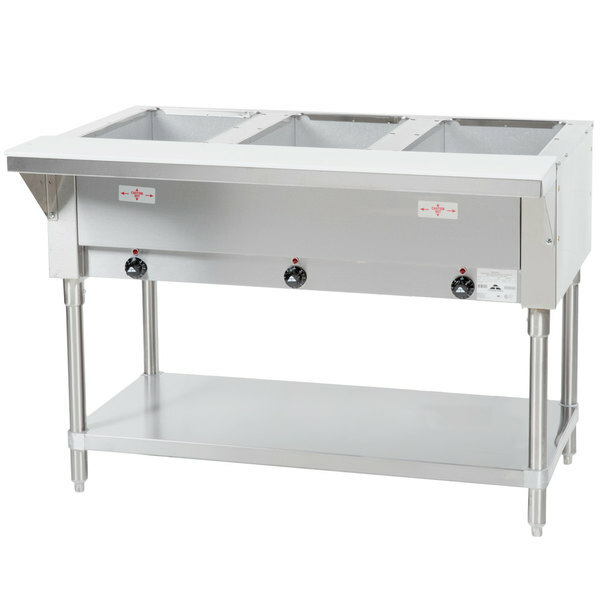 The HF-3E-120 has a top made from 20 gauge type 302 stainless steel with die stamped pan openings, plus a body made from 22 gauge type 430 stainless steel that offers a sleek appearance. 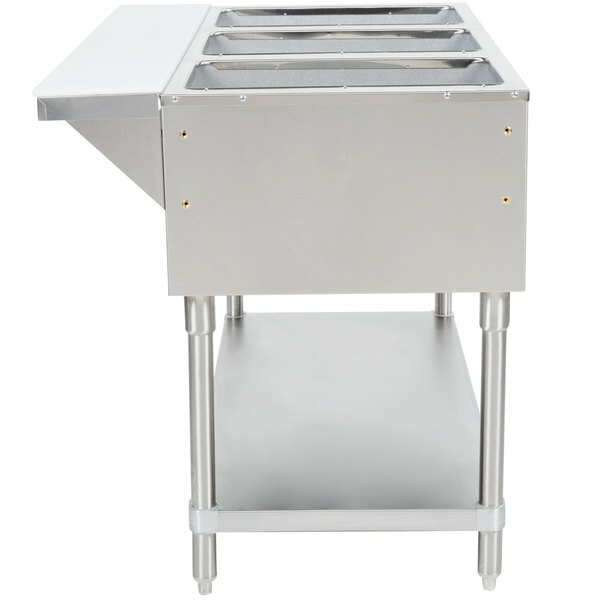 The sturdy legs are made with 1 5/8" diameter tubular galvanized steel, and adjustable bullet feet will accommodate a variety of floors. 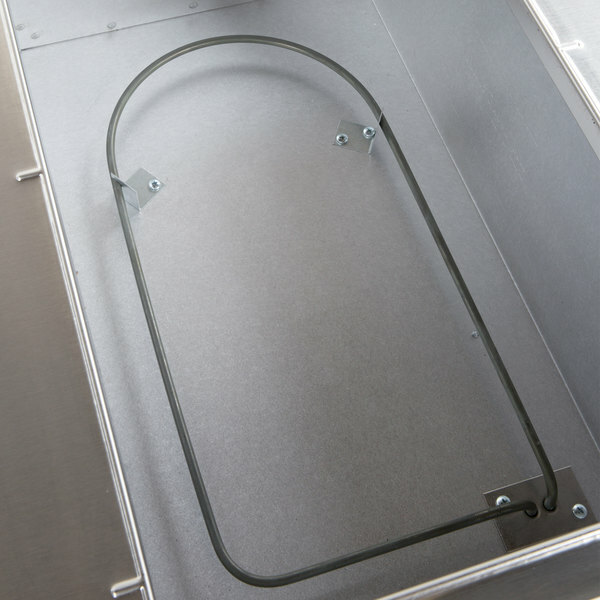 The durable undershelf is easy to assemble and can be adjusted as needed. It's great for storing extra serving utensils, food pans, lids, and other necessary equipment to keep everything you need close at hand. table comes all pre assembled the only thing required is to slip the legs into the table and tighten the screw, very simple and product looks very professional. Webstaurant provides very prompt service at great prices. I can normally buy from them at a cost equal to or lower than my local supplier, with faster delivery. LOVE THESE GUYS!!!!!!!!!!! 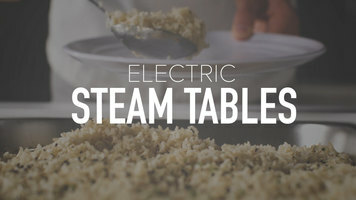 The Advance Tabco HF-3-E Three Pan Electric Steam Table with Undershelf- Open Well works great. Had an issue with the electrical cord, we had to get an adapter. Also our covers we had did not fit it, so need to order those too. Other wise it has been working great!! It fit our nutrition site perfect.